Everyone has their secret techniques to go the toilet, whether they work for you or not, you know that you should visit your bathroom at least once a day. And if you're not one of those that pull it off at their first attempt, you probably spend some time reading a newspaper, a comic or a book. That means you should be interested in downloading Toilet Time, the application that brings together bowel movement and new technologies. The ultimate collection of games for your moments in the loo. 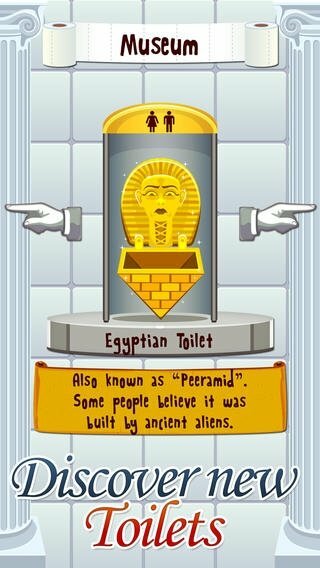 In Toilet Time for iPhone you'll have a well-chosen selection of minigames set in the toilet universe, to have that little extra entertainment always necessary while you spend time in the WC. Games that include missions that, once completed, unlock special keys, objects and treasures that will liven up your intestinal activity. Cockroach: kill cockroaches that come out of the drain. Vacant: find a free toilet. Temperature: regulate the shower's temperature. Accident: prevent objects accidentally falling into the toilet. Tubes: avoid the smelly toilets. Paper: manage to unroll all the toilet paper. Cleaning: aim well and clean the toilet with your pee. Sort: help men and women enter the right bathroom. Cover-up: cough at the right moment to disguise suspicious noises. Now you know, forget about eating cereals with added fiber or special anti-constipating yoghurts, and download Toilet Time if you want to make your time on the bog the best moment of the day. This application offers in-app purchases.